Dear travelers! I gladly welcome you on my website! Let's get acquainted. I, Shavkat Yusupov, was born in 1987 in Bukhara. I've lived here all my life and know my city, every lane, every monument of it and centuries-old history, local legends and amazing places, much of what you do not learn anywhere else, but that will enrich your inner world, expand the range of emotions and impressions. 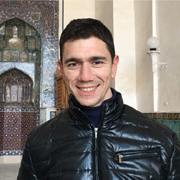 I have seen many tourists and guides from childhood who told about the sights of the city, and dreamed, when I grow up - I will also conduct excursions and tell the history of Bukhara and Uzbekistan, but in my own way! In each of my excursions there is a lot of interesting and informative things, but also there is a place for the best emotions and impressions personally for you. Therefore, it will not be boring! Now, seeing the happy faces of my clients, I can say that I found myself, my place in this life, I'm a guide in Uzbekistan. I like to work with tourists. I love my job! Uzbekistan State University of World Languages, faculty - English philology. I speak the languages: Uzbek, Russian, English.